Famed anonymous street artist Banksy gifted Melbourne the ‘Little Diver’ stencil in 2003. The building owner whose wall Banksy worked upon, was aware of the value of Banksy’s works and paid for a sheet of perspex to conserve the work. To conserve a work is to protect it from harm or destruction. Ironically, such an act of protection over what was deemed a culturally important work lead to the ultimate destruction of it. In 2008 the work was defaced when someone poured silver paint behind the protective Perspex and down the artwork. They then proceeded to tag ‘Banksy woz ere’ on the plastic. It is possible the destruction of the work beyond repair was in protest to the concept of trying to preserve an art form that is generally intended to be ephemeral. This example surfaces a number of questions in regards to what we identify as culturally important. Does a work’s monetary value constitute its survival? Or should we place more importance on a work that makes an important political, cultural or social statement? Melbourne street artist Phoenix responded to the destruction of this iconic work with his own restoration of it; ‘The Little Diver Resurfaced’. He pasted up a copy of the original work in the same location as an overlay so as to ensure the work still remained in some form. 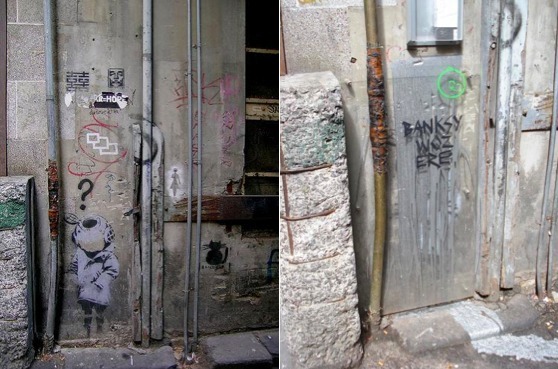 “Banksy's Little Diver by Swanston St and Flinders Lane,” Street Art deTours, accessed April 24, 2019, http://streetartdetours.com/document/1184.